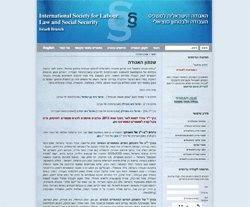 Labour, Society and Law is an annual publication of the Israeli Society for Labour Law and Social Security, published under the joint academic auspices of Tel-Aviv University and the Hebrew University of Jerusalem. It is dedicated to discussions of the labour market and the welfare state, that shed light (both theoretical and practical) on issues of importance to Israeli social policy. The journal’s approach is multi-disciplinary and it includes contributions from legal researchers as well as other disciplines (notably economics, sociology, management, social work, history). Current and past issues (in Hebrew) can be located here.